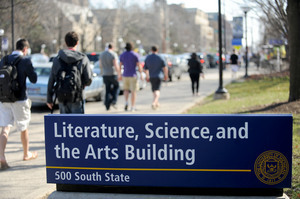 Posted on Tue, Mar 6, 2012 : 7:26 p.m.
Two wallets were stolen during possibly related thefts in the University of Michigan’s Literature Science and Arts Building Monday and credit cards from both were used to make unauthorized purchases. Two thefts were reported at the Literature, Science and the Arts Building. Diane Brown, U-M Public Safety Department spokeswoman, said Tuesday there are no suspects in either theft but they are probably connected. The first theft was reported at 4:10 p.m. Monday in the second floor of the building, according to police. The theft reportedly occurred sometime between 7 a.m. and 1:30 p.m.
A wallet was stolen from an office, and a credit card was used to make purchases before it could be canceled, according to police. The second theft was reported at 4:15 p.m. and occurred in a fifth-floor office sometime between 12:45 and 1:30 p.m., according to police. Similarly, purchases were made with the card before it could be canceled. The LSA building is located at 500 State St.
Police still are looking for suspects and anyone with information on these incidents is encouraged to call the U-M Department of Public Safety tip line at 1-800-863-1355. Thu, Mar 8, 2012 : 3:51 a.m. Wed, Mar 7, 2012 : 8:38 p.m. This is a sad day for America, when someone steals a credit card and then actually uses it. Who knew that's what they had in mind in the first place? Oh, the horror. Always write &quot;See ID&quot; on the signature portion on the back of your credit card. I automatically show my driver's license with my credit card. Wed, Mar 7, 2012 : 5:08 p.m.
Yea, that's fine for when you actually give your card to a person, but that happens less and less in transactions now. That wouldn't have helped at Redbox, and they probably used the self-scan line in Meijer. Even if they DID go through a line with a cashier, there's at best a 50/50 shot the cashier would even look at the credit card. Wed, Mar 7, 2012 : 3:28 p.m.
Set up a sting operation with cameras and sound, arrest these thief's and put them away. Wed, Mar 7, 2012 : 5:53 p.m. Please, exactly...protect your employees if our buildings cannot be locked down. Wed, Mar 7, 2012 : 1:48 a.m. In other shocking crime news, someone jaywalked at main and liberty. Wed, Mar 7, 2012 : 5:52 p.m. It's not a joke when it happens to you. Wed, Mar 7, 2012 : 2:28 p.m.
if this was you on the other end it would not be so funny.aa.com is reporting the news of the local area it is not meant to be entertaning but rather informative. Wed, Mar 7, 2012 : 1:29 a.m. Lock your stuff up, folks. Even putting wallets or purses in desk drawers or filing cabinets that are not locked is not sufficient. These thugs make the rounds in UM buildings, especially the buildings on major streets such as State. Lock everything up.